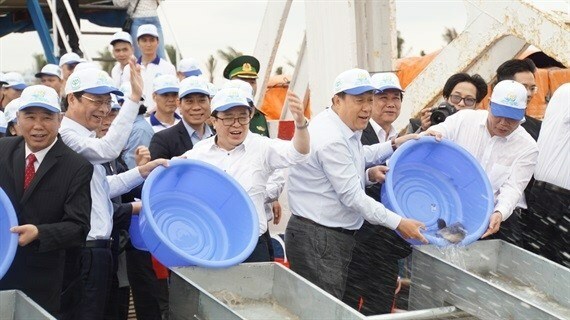 Quang Ninh (VNA) – Nearly 5.3 million breeding shrimps and fish, and other aquatic species were released into the sea off the northern province of Quang Ninh on April 1. The event was jointly held by the Vietnamese Ministry of Agriculture and Rural Development (MARD), the provincial People’s Committee and China’s Ministry of Agriculture and Rural Affairs as part of activities marking the 60th anniversary of the Vietnamese fishery sector (April 1). It also aims to restore aquatic resources in the Gulf of Tonkin. About 30 million breeds of aquatic species are expected to be released into the sea by 45 Vietnamese cities and provinces in 2019. MARD Minister Nguyen Xuan Cuong said the activity has significantly contributing to restoring aquatic resources and raising public awareness of aquatic resources protection, thus further developing fisheries in the Gulf of Tonkin and in the country in particular.